I've had a couple recent outdoor adventures. I went camping with my family in the San Rafael Swell a couple of weeks ago and I had a blast. 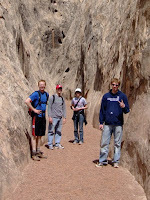 We hiked through some really cool canyons and had a fun time camping. If you're ever near Goblin Valley, definitely check out Crack Canyon. It's not as popular as Ding and Dang or Little Wildhorse, but the crack that it gets its name from is definitely worth hiking to. Crack Canyon can also be done in less time than the others I mentioned--a couple of hours should be enough. My sister's husband Evan wrote a blog post about our trip that goes into more detail. 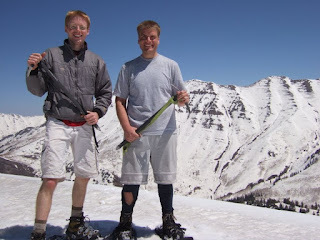 Last Monday I made it to the top of Buckley Mountain with my friend John. We had both tried multiple times before to summit it without success, but we finally made it last week. The route we took was really cool: we went up Little Rock Canyon (near north Springville) and then followed a drainage up to the summits (Buckley has two). If you're ever looking for a great scenic hike to go on, think about Little Rock Canyon. It has huge towering cliffs, fun (but easy) rock scrambles, and a surprisingly decent trail for a canyon that supposedly doesn't have a trail. It's beautiful.